Our depot is important historically to our town and residents as a reminder of the past, why our town is here, and how our ancestors lived and traveled. Architecturally, the building is unlike any other in town and it is easy to tell it was built in years gone by. The Chicago, Milwaukee, and St. Paul Depot in Clinton is located at the west end of Clinton's Main Street along the Chicago, Milwaukee, and St. Paul trackbed. Surrounding the depot are circa 1900 commercial buildings to the north and east, the Crown Grain Elevator to the south, and an empty lot to the west. The depot stands in a small park created by the local depot preservation committee. The railroad tracks next to the depot were removed in 1980. 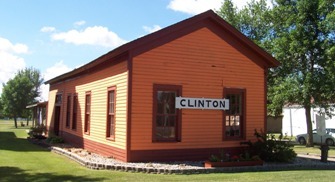 The Clinton Depot, which was built in circa 1885, is a small wood frame building which represents one of the smallest combination depots designed and constructed in Minnesota by Chicago, Milwaukee, and St. Paul Railroad. It was probably built following a standardized plan executed by the railroad's Bridge and Building Department based in Chicago. The one story building has a gabled roof covered with wood shingles and clapboard siding. The building has rectangular 6/6 sash, freight doors on the east and west facades, and a passenger door on the west facade. Early photographs reveal that the depot originally had a rectangular bay window on th west (trackside) facade and a single leaf door with a transom in the western bay of the north facade. The interior contains a waiting room with hardwood floors and decorative wainscoting at the north end, and office in the middle, and a freight room at the south end. The Clinton Depot is largely intact and in excellent condition. Early exterior alterations included changing the north door to a window, changing a double hung window on the west side to a fixed sash window, and enclosing the trackside bay window. After standing vacant since 1969 the depot was recently purchased and renovated by the Clinton Save the Depot Committee. The group repainted the building in 1982 and refurbished the interior to create a small museum. In 1983 the committee landscaped the grounds and installed a sidewalk, picnic tables, and a railroad crossing sign.